Migrating to VoIP on a Gigabit Ethernet LAN doesn't have to be an expensive proposition. When adding Business VoIP Phone Service and Hosted PBX / Virtual PBX to your LAN there are several expenses to consider. Gigabit Switches (especially POE) and Gigabit VoIP Phones are more expensive than their 100mbps counterparts. Wiring can also add expense during a LAN upgrade. This guide will help you answer the following questions. I have a Gigabit Ethernet LAN and I am moving to VoIP, do I need to buy Gigabit Ethernet Phones? The most common office configuration consists of one desk for each employee. At the desk you have a PC and a phone. There is a single network cable going to the desk. This network cable first connects to the phone, and then through the phone to the PC with another short cable. This provides both the phone and the PC with network connectivity. However, the PC is limited to the bandwidth rate that the Phone supports. If the LAN switch is a gigabit ethernet switch, and the PC has a gigabit ethernet interface, putting a standard 100 mbps VoIP phone in the middle will drop the rate of the connction down to 100 mbps, thus negating the two gigabit ethernet components. This article discusses the trade-offs and considerations surrounding this environment. Here are your options. All this talk boils down to choosing one of the following three options. The simplest way to choose between them is to answer the, price each option, and decide if the cost is worth the benefit. There are factors that vary from business to business. Here are some questions that will guide your decision. Do you have Servers on your Premise? Businesses are undergoing a fundamental technological transition, with servers moving away from the business premise and being replaced with services in the cloud. When a service is accessed in the cloud, the bottleneck in communications with that service is often the bandwidth of the connection to the internet. When the server is located on the business premises, the internet connection is not a factor and the desktop computers communicate directly with the server over the LAN. If you do have servers on your premise, you should consider the maximum throughput between one individual client and the server. Often this maximum throughput is much less than 100 mbits per second. A server talking to multiple client connections simultaneously could exceed 100 mbits per second. For this reason if you have servers on your premise, you may consider putting your servers on a gigabit ethernet segment of your lan and your PCs on a 100 mbps segment of your LAN. If you have servers on your premise, we generally recommend . How much bandwidth do you have on your uplink to the internet? How much bandwidth are you using? It is a common misconception that simply upgrading a LAN to Gigabit Ethernet will make all of your interactions with the internet faster. There are two scenarios where upgrading from a 100 mbps LAN to a Gigabit Ethernet LAN will not make any difference at all to your perceived speed. If your uplink to the internet is less than 100 mbits per second, upgrading to a Gigabit Ethernet LAN will not increase your speeds to the internet. Your speeds will be bottlenecked by your internet uplink. If you are not using more than 100 mbits per second, you will not notice the difference after upgrading to a Gigabit Ethernet LAN. A 100 mbps LAN would sufficiently meet your resource demand and would not be the bottleneck in your communications. Most small businesses are not using anywhere near 100 mbps on their uplink to the internet. This means that will likely be your most cost effective solution without negatively impacting your performance..
Do you want Power Over Ethernet? Power Over Ethernet is a technology that eliminates the need for power adapters for VoIP Phones. This means that you can simply connect a VoIP Phone to the network and it will power on. This makes cabling at the desk neater, as it removes the power plug, and it makes moving phones from one location to another easier. POE also enables higher reliability during a power outage because you can put a UPS on the POE switch, and in the event of a power outage your VoIP phones will stay powered on. Power Over Ethernet technology is implemented in the LAN switch and is supported by most all VoIP Phones. Switches do not come with POE standard. If you must have Power Over Ethernet, you should note that this is a particularly expensive option on Gigabit Ethernet Switches. Is this a new construction? Is the network cabling already in place? How many network cables go to each desk? is to run two parallel physical networks; one for your computers (data) and one for the phones (voice). That means two cables for each desk, one that plugs into the PC and one that plugs into the phone. It also means two sets of switches. This allows you to separate the VoIP LAN from the PC LAN. This greatly simplifies your network. 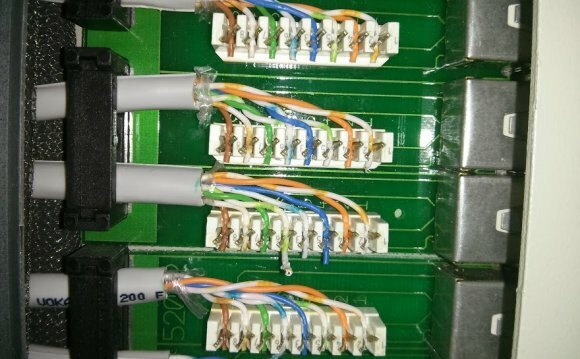 If you are doing a new construction and you have not yet ran any of your network cables, this could be a cost effective option. Running two cables instead of 1 does not add on much cost. On the other hand if you already have your entire office wired, going back and adding additional runs to each desk can be prohibitively expensive. If this is a new construction you may want to consider parallel networks, detailed in .